The schematic is also available as a PDF here: precision_voltage_reference_sch. 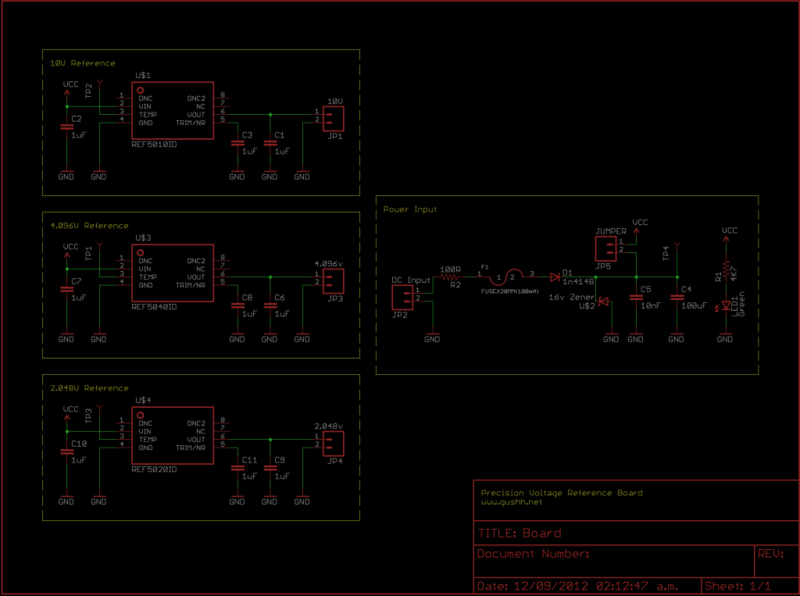 I don’t have clean gerbers since I toner-transferred the PCB, but if anyone wants the layout I’ll upload it as well. I personally used BNCs for the output of each reference. A note about the output capacitors: They’re quite important for stability, make sure you read the datasheet to understand why! For extra stability and reliability you should use a shielded enclosure as well. Compared to buying proper calibration references, the price of this whole box is quite accessible and just about anyone can build it. At 0.05% for these references, I’d say it’s pretty darn good for most home labs. To think back in the day you would’ve used a mercury D cell and a fairly accurate thermometer to obtain a “trustworthy” DC reference! — I’m sure most HAMs would attest to this!